RAKED is a ritual performance that demonstrates the construction and deconstruction of a powder covered hill. Set on a private residence on Rose Hill in El Sereno (located in the Eastside LA area,) the performers rake debris on a hill on the side of the house as audience members enter the performance space. The dancers methodically distribute the purple pigment powder across the hill, creating a surreal landscape on which the performers then begin to dance. 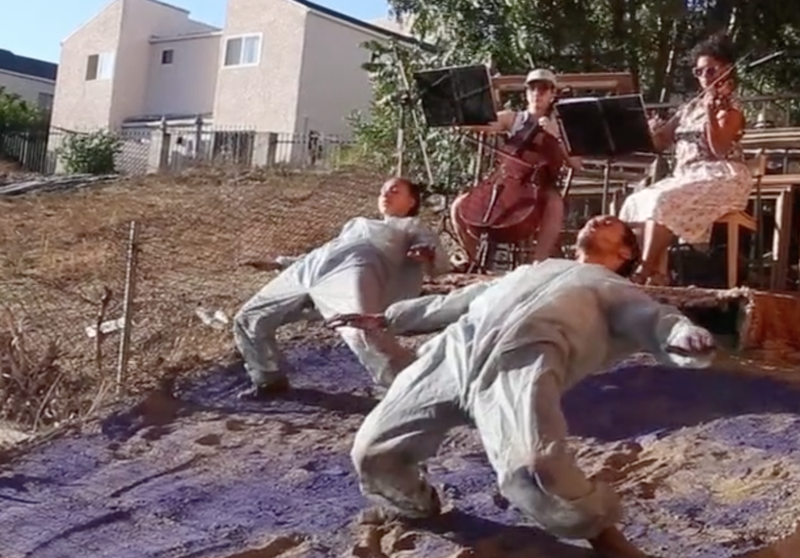 The dancers move throughout the hill, and the purple pigment powder flies up into the air mixing with the dirt beneath it, and obliterating the surreal surface, bringing it back to its original, yet somewhat altered state. The ephemeral nature of this performance may highlight the impermanence of life, and illustrate the lasting and often damaging impact humans have on this earth.